“Any signs of lunch?” . . . .
Eagles are a common sight during the winter months, and a recent outing for the annual eagle count turned up quite a few within a short distance from home. 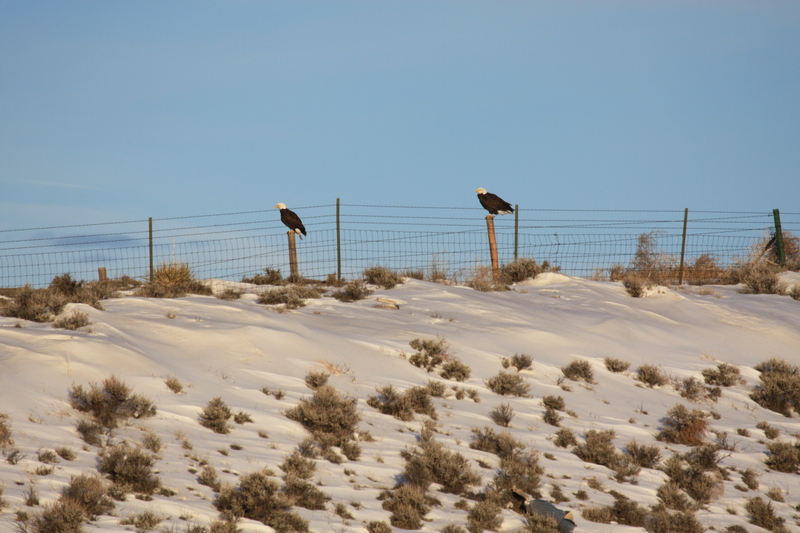 The stately looking pair of mature bald eagles in the photo above were near the highway watching for roadkill. Their traditional food source of fish is unavailable due to frozen streams, so they must improvise. “There goes the neighborhood, look what blew in!” . . . . 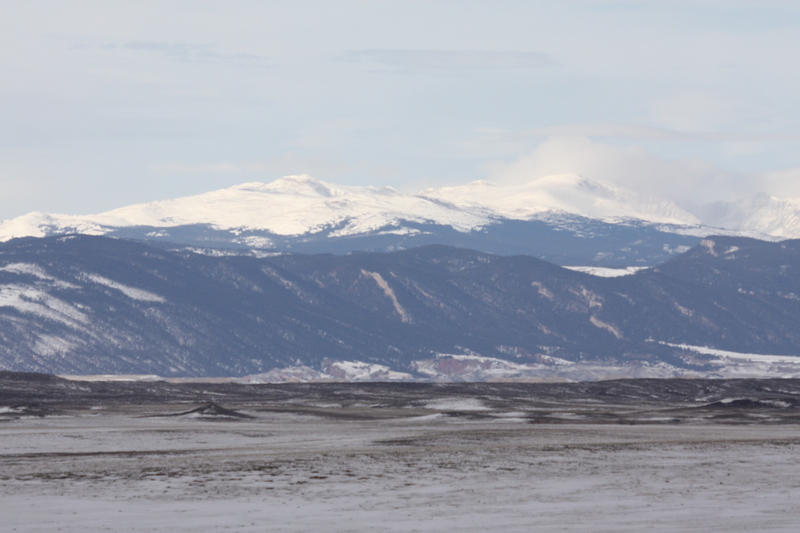 I had just finished photographing the two eagles sitting on fence posts, when a third bald eagle floated in on the gusty winds, accompanied by two large ravens. All this avian excitement must have been due to a dead antelope or deer carcass on the hillside. There was nothing along the highway to draw such interest. “Prairie dog town in my sights” . . . . 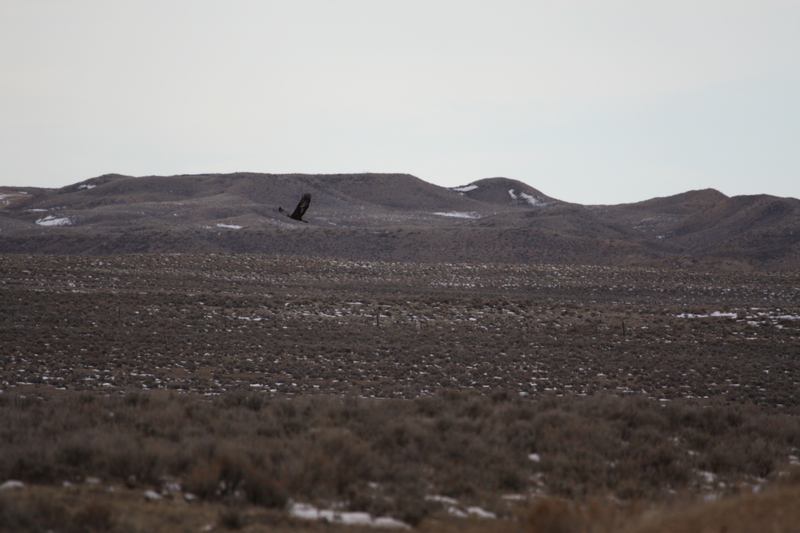 This golden eagle was floating along on the wind near a prairie dog town. The pronounced white markings on his wings indicate he was an immature golden and he was the only one we spotted in the two hours that we searched. We tend to see fewer golden eagles, who are a bit more reclusive. Prairie dogs out for a bit of fresh air keep an eye out for raptors up above . . . . 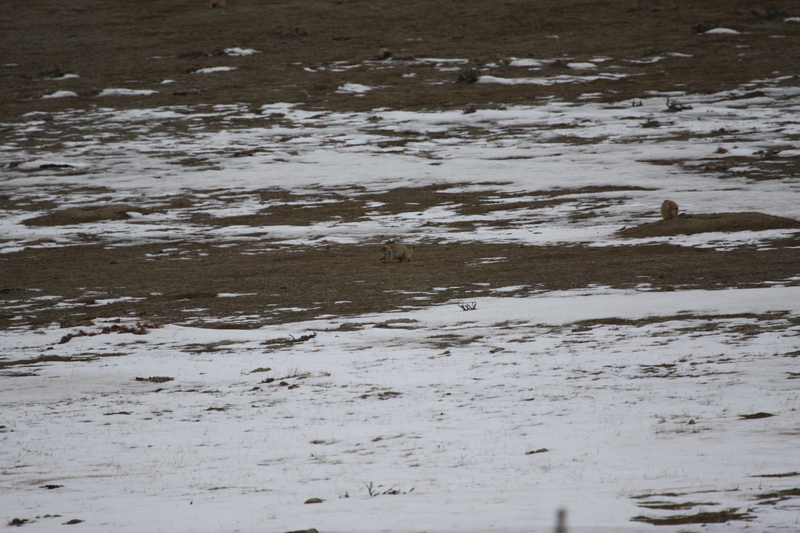 The prairie was teeming with life in a prairie dog town covering several acres. 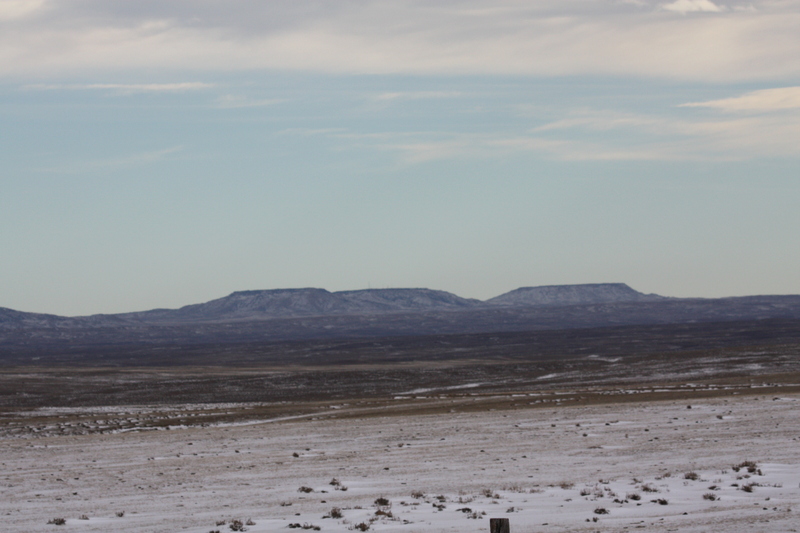 Each mound was occupied by a pair who were hovering near the opening just in case they had to make a dive for safety. Sharp warning barks announce the arrival of danger. 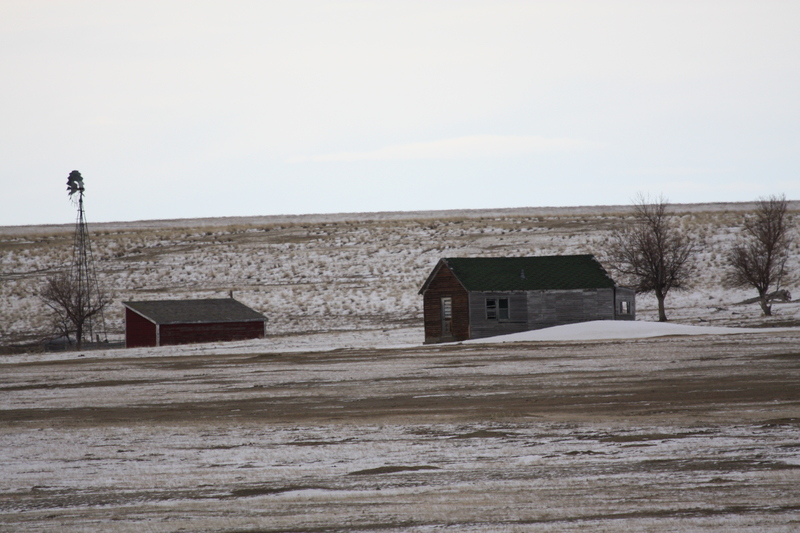 Abandoned ranch buildings bear witness to better days . . . .
What was once home to a pioneer ranching family, this old place sits deserted and lonely on the prairie. The fan on the windmill blows in the wind, making the only sound. 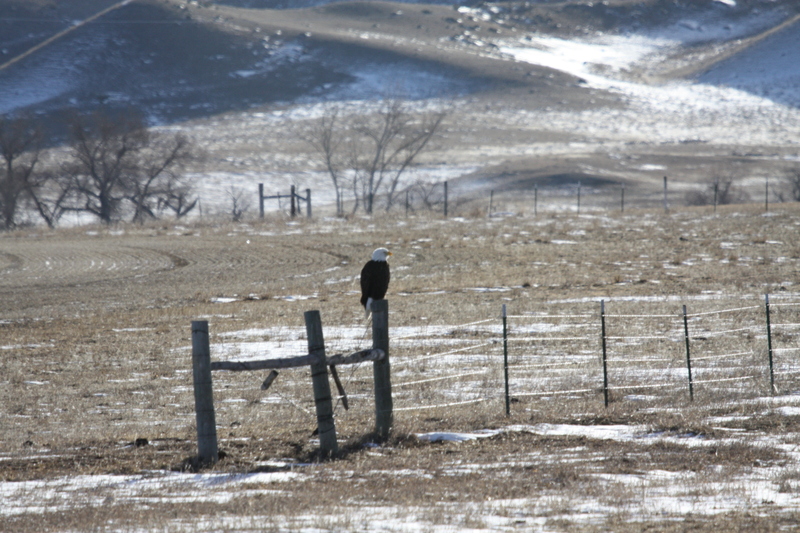 Another mature bald eagle rests on the brace posts of the fence. It’s a good level spot to watch the action on the ground. “From up here, I can see forever” . . . . 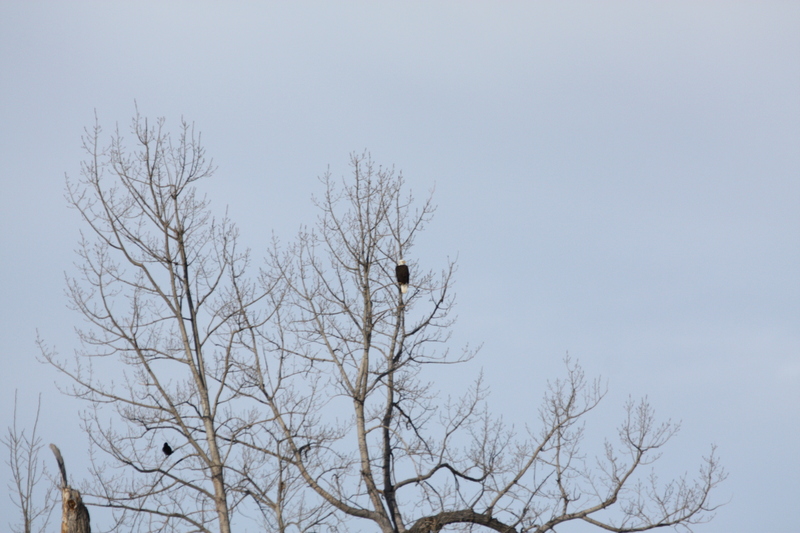 This bald eagle and a raven (lower left) have chosen a tree top to scan the horizon for a meal. To the east, the Pumpkin Buttes . . . .
To the west, the Big Horn Mountains . . . .
Log remnants of homestead cottage . . . .
As our journey took us back toward home, we stopped to pay a visit. An old homestead cabin where my parents spent the early years of their marriage now lays on the ground, moldering into dust. 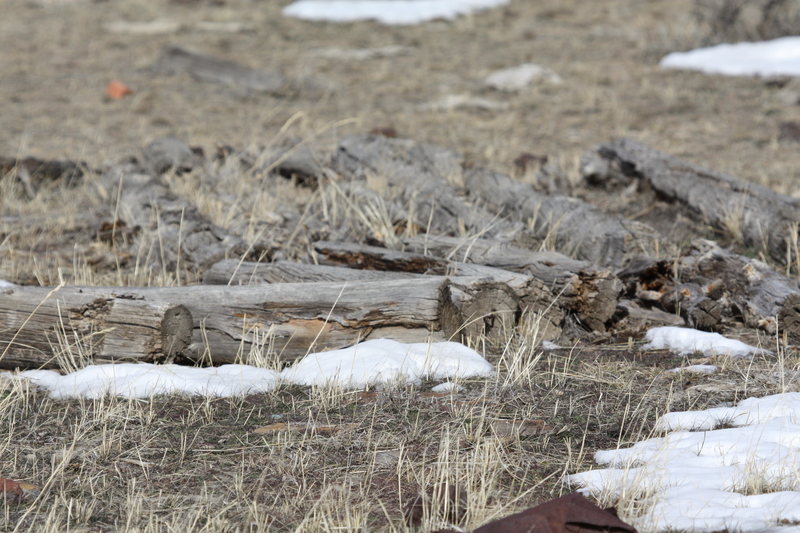 The cabin was taken down and the logs laid out and numbered with the goal of rebuilding at ranch headquarters about five miles away. Too many years swept by and the logs stayed put. A black horse hangs back . . . .
We came upon a small band of horses running across the prairie. 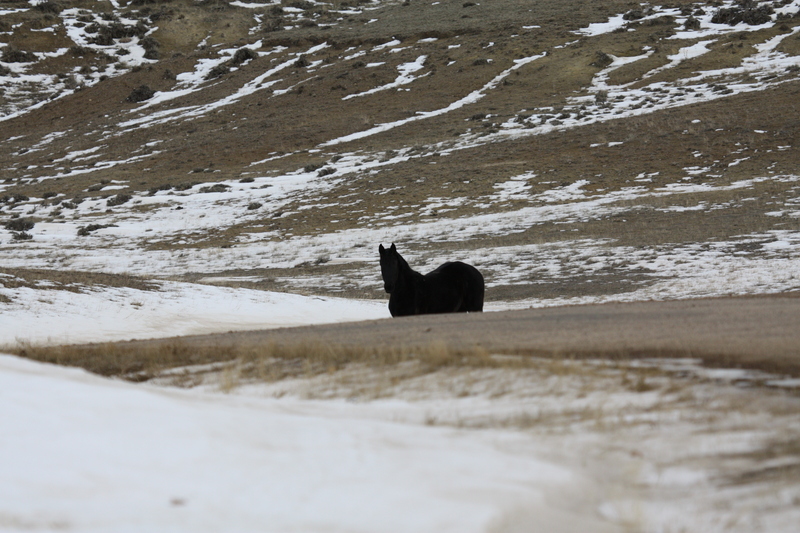 By the time we could come to a stop and get the camera ready, they were out of sight except for this black horse, who hung back and watched us for a few minutes. It tossed its head and took off after the others, apparently satisfied we were not carrying a bale of hay in the back of the jeep. Which is it? 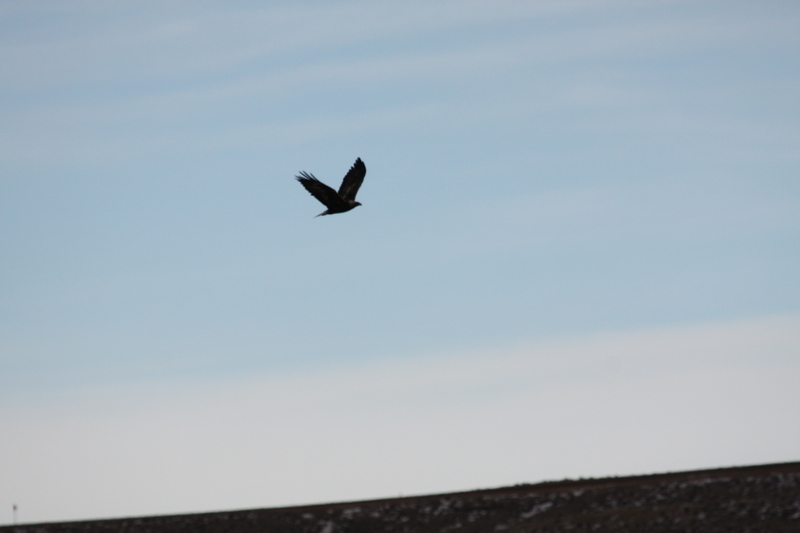 . . . .
We had a hard time deciding whether this was an immature bald eagle or a golden. The shape of the head looks like a golden, but it is difficult to gauge the length of neck or tail feathers in flight from this angle. The wing fingers are more pronounced, and we ended up deciding it was a young bald eagle whose head feathers had not yet turned white. In all, we counted eight eagles in about two hours of driving which was about an average number to be seen in the immediate area. 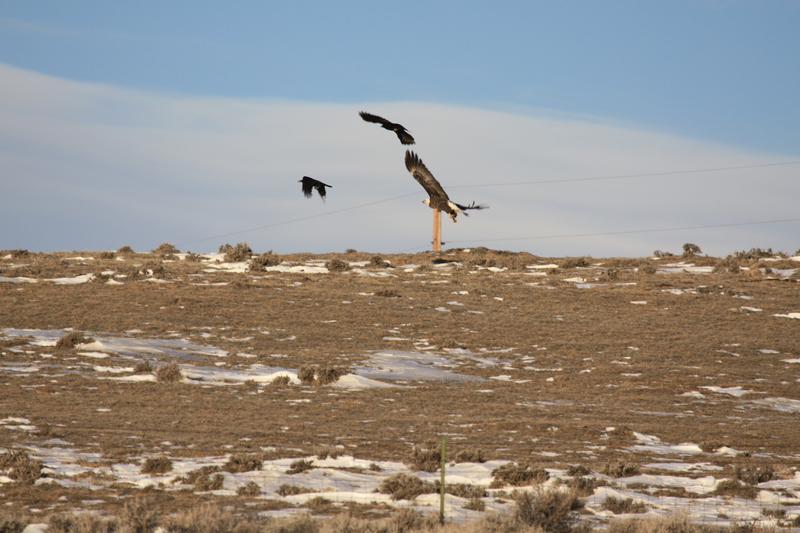 We will wait for the Bureau of Land Management report from other “eagle spotters” and hope these majestic birds are maintaining a healthy population.